My experience was similar. The dealer installed the latest available thermostat, which, I assume, was the same brand as you used. Wahler is the original thermostat sold by dealer. I bought a whole bunch of them last year for ten percent of dealer price. In Canada I can get them for $75, I bet you did a lot better than that. I got them for trade price. Only £3.75 each. Sorry, need them myself for my business. Can no longer source them for that unbelievably cheap price. 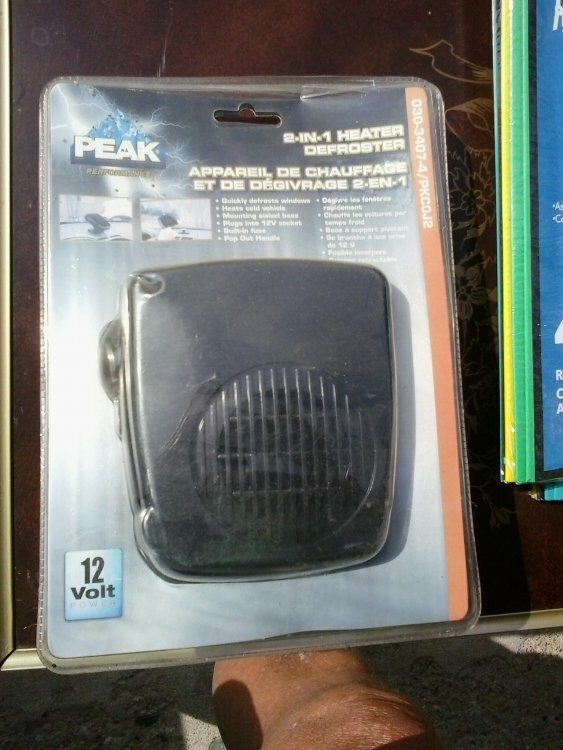 If you have a diesel and have stop and go traffic which results in little or no heat, an inexpensive alternative is the 12V heater pictured below. It plugs into the cigarette lighter. It is available at Canadian Tire for about $10. I think fitting a plug in 12 volt fan heater will result in NIL extra heat and possibly flat battery. Reason: The 450 Cdi has a built in auxiliary electric heater which is powered by a load shedding controller. Power to this heater is only supplied when power is available. Fitting an additional heater means less power to the built in heater. Best way to get heat on those cold mornings is to keep revs up so stay in gear for longer. More electric power becomes available to feed auxiliary heater plus engine heats up faster. Thanks for the input Tolsen. I found in my 450, the built-in electric heater provided little on no extra heat. Although the aftermarket heater I showed above isn't going to make anyone think of warm tropical breezes, it does take the nip out of the air and it is meant to be used while the car is running, so no dead batteries unless your alternator isn't working. The built in electric heater booster fitted in the 450 Cdi provides a maximum of 770 Watts of heat. In mine I get heat instantly as soon as glow plugs have completed their post start heat cycle. Perhaps yours is broken Leadwing or you have not turned it on if you can't feel any heat . The electric heater booster is controlled by glow plug controller. 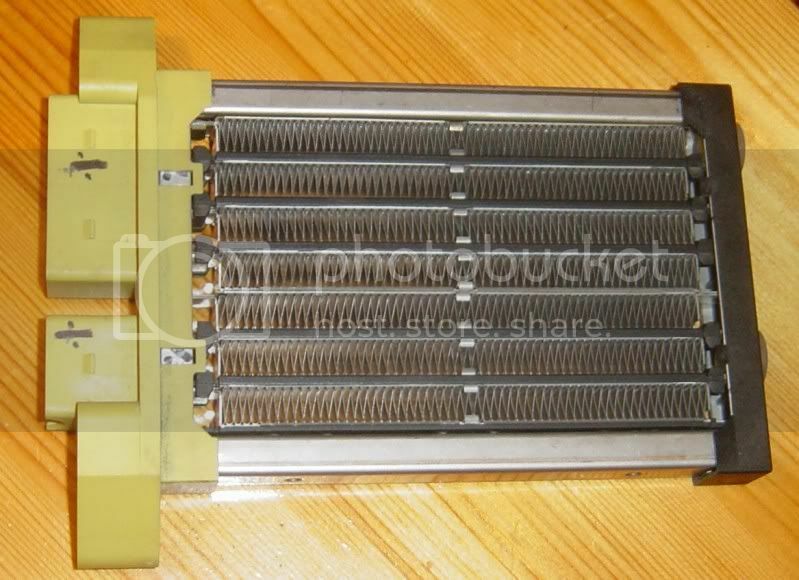 Heater contains four PCT ceramic elements. 3 x 210 Watt and 1 x 140 Watt. Interesting. Now I know where to look. Thanks Tolsen. I have two 450s and the Cabrio only had 4,800 kms on it when I got it. Neither of them have aux. heaters that provide any heat whatsoever. I find it hard (but not impossible) to believe that two random 450s, one of them almost new when bought, have heaters that don't work. However, I will get our local smart genius to check it out after the holidays. My '05 and '06 both heat faster when the aux heater function is activated. On the drive from Lambeth to the airport dozens of times (25+km), have had to reduce the temp level as it gets too warm. The heat doesn't arrive that fast, but it's more than adequate when it catches up. Ladies tend to expect instant heat, but not in out little diesels. They are what they are, unless they not working right. My heated seats also become too warm quite quickly, much faster than Cadillac CTS or ATS. I have no issues with either of my 450's HVAC systems. Mine used to be rather poor. Someone kindly sent me a new glow plug controller for free and since installing that one my heater booster has been a real blessing. Today @ noon.... temp -2C, winds SW 30km gusting to 50km, wind chill -10C. From north Lambeth driving south. 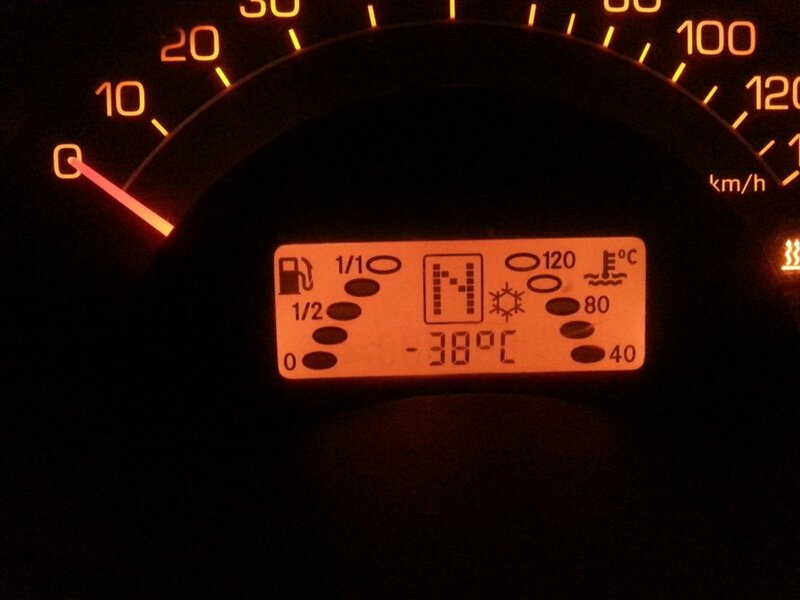 Had to turn the heater temp down to mid-range as I crossed the 401 on my way to Picard's in Talbotville, about 12 km. Used aux heater initially, but didn't use heated seats. Guess I'm toughening up in my old age (or maybe I'm too stupid to realize I'm cold). These cars generate more heat than propulsion power so no need to suffer. Mine is always warm and cosy. Keep heater to max even on the hottest summer day. Do not want to waste heat to the crows. Nearer to the Arctics but less barren compared to most of Canada. Also mild winters with hardly any snow, although far too much rain. The only way to thaw this thing out in these conditions is my webasto. I have starting issues as it is, in the cold its impossible. When I drive on the highway in this cold I run the webasto to keep the heat up. Otherwise even with a waxed cardboard 'winter front' over the rad, and -50C coolant it will lose heat. This isn't even the coldest I've made the poor thing work in. I'm still confused about the Restrictor or constrictor idea of reducing the flow through the system to improve compartment heater problems. Why bother with any of these if replacing the thermostat is the correct procedure? Does the thermostat fail that often or quickly? Does the flow constrictor reduce the flow if and when you have a failed thermostat? I did lots of trials testing out different size orifices when developing the restrictor plug. Decided on 8.5 mm diameter hole size as being optimum. 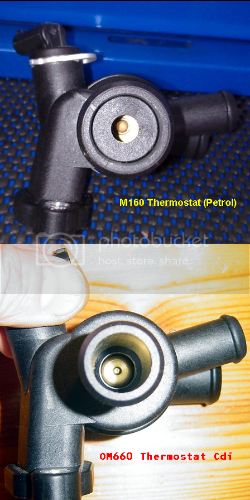 Later member 2minits advised the petrol 450 has the restrictor built in and orifice size is same as my restrictor plug. The barbed outlet facing you is the bypass from thermostat housing to cooling pump. Note no restrictor orifice in our diesel thermostat. 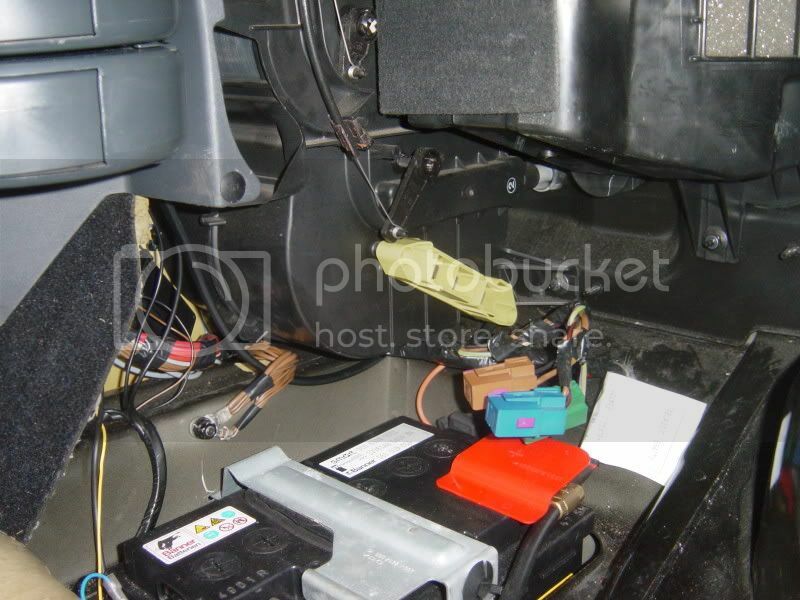 Where is this Webasto car heater installed? Does yours run off diesel fuel? I followed this post almost exactly. Mounted under the fuel filter under the driver seat, 'T'd into fuel return line between engine and tank. Weirdly this is the only place to draw fuel from. If it is freezing cold blocking air flow through the intercooler will also help to keep you warm. We had a discussion about this a few years ago; these cars do not have a means of heating the intake air like most other cars do.